Lone Pine and its surroundings are very very haunted. In addition to having played host to hundreds of movies and television shows, and possibly being the natural habitat to a winged demon, Lone Pine harbors multiple spirits of the dead. Here are just a few of the ghost stories being told about the town. 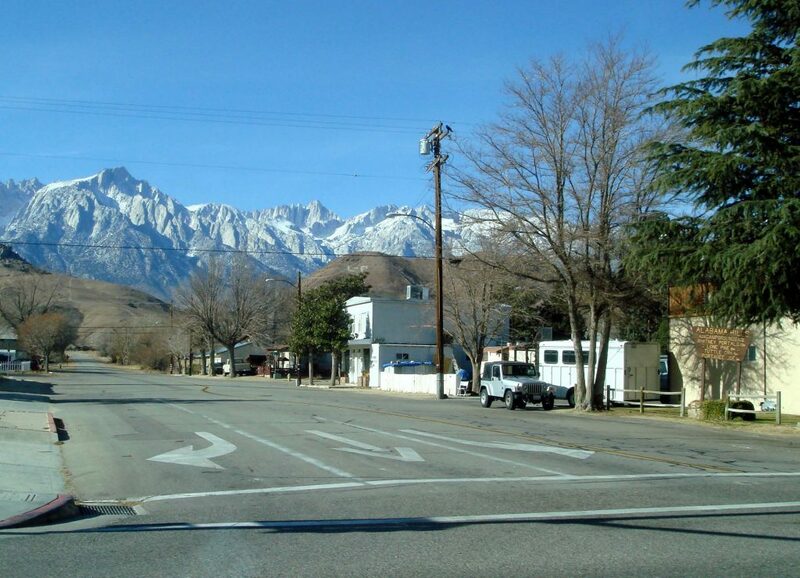 Whitney Portal Road is the only road in Lone Pine crossing Highway 395 with a stop light. It leads west out of Lone Pine, through the Alabama Hills, and up to Mount Whitney, the tallest mountain in the continental United States. The road also plays host to phantom battles between ghostly Native Americans and U.S. soldiers. Originally the area around Lone Pine was populated by Paiute Indians. Everything was fine until 1860 when settlers began moving into the valley overrunning the tribe’s lands with cattle and sheep. Conflict began when in the winter of 1861 – 1862, the Native Americans having issues with their food sources due to the settlers being on their lands, on the brink of starvation, finally turned to slaughtering and eating the settlers’ cattle. The Owens Valley Indian War soon followed. During the war, one battle was fought on what is now thought to be present day Whitney Portal Road. Over the decades, several residents have had their day suddenly disturbed by all out battles raging right outside their home’s windows. In the 1960s one woman who lived on the road heard gunfire one evening. Looking out the window she saw a black man dressed as an Indian warrior. He glanced back at her, but didn’t bother her or confront her. He was soon joined by several additional Indians. They all crouched behind a tree and began firing rifles, reloading as necessary. The firing went on for fifteen minutes with not a bullet hitting the woman’s house. Then, just like that, they all disappeared. Apparently the tale is fairly common amongst those who have lived in the neighborhood. Those who have heard the woman’s tale, believe the black man to have probably been an ex-slave, now living amongst the Native Americans. Old bullet holes were even discovered in the direction the ghosts had been firing in. Whitney Portal Road is not the only location near Lone Pine with phantom battles. Long ago, back when the trains ran to Lone Pine and the rest of the area, four passengers on one of the trains, all in different parts of the train witnessed a full on ghostly battle taking place near Owens Lake. Native Americans were battling American soldiers, the sounds of the horses and gun shots rang in the passengers ears, and the men and animals looked real. Both soldiers and Indians fell in the battle before the witnesses. Upon arriving in Lone Pine, the witnesses told their tale . . . their tale of a battle that had actually taken place near Owens Lake over six decades before. Continuing down Whitney Portal Road, you eventually arrive in the Alabama Hills. Over the years, a legend of a ghostly Indian has surfaced, the legend of Rescue Man or Indian Jim. Jim, a gold prospector, died in the hills in the 1940s, trapped in a sudden blizzard with the temperature plummeting below zero. Jim now helps out people who are in the hills before a storm hits, warning them to race back to town while they still can. The first person known to have run across the spirit of Jim was a friend of his, another Indian named George. George had been up in the hills looking for Tungsten, when suddenly Jim was in front of him calling his name. Jim warned George to “Go” pointing back towards Lone Pine. George, deciding it best to not ignore the ghost’s warning, high tailed it back to town, just as horrifically strong blizzard crashed into the area. George surely would not have survived the storm if he had not been warned by the spirit of the Rescue Man. In 1870, some Native Americans who lived in Hog Back Creek, about ten miles outside of Lone Pine, decided it would be a good idea to attack a shipment of government gold being sent to pay the U.S. Army. When the thieves brought it back to the rest of Native Americans at Hog Back Creek, their leader freaked out at the unauthorized raid, and worried that not only the government, but also local robbers and bandits, might soon descend upon their home, he ordered the $10,000 in gold buried on the spot! One brave was ordered to watch the location of the gold and to let no one go near it. No one in the group was allowed to ever talk about the incident. Well something like twenty five years past, and the Native American guard, now into his sixties, was still protecting the cache of buried stolen gold. By now, however, Lone Pine had grown in size, and the nearby white settlers decided that a firehouse needed to be built . . . right on the spot the Native American was protecting. Well he wasn’t thrilled about the new building being erected on the land he was guarding and made it known. And when he was denied access to the land, he got upset and ended up getting himself killed. He was buried by other Native Americans nearby. But, even in death, he kept protecting the land! It is said that his group’s head man, even presided over his burial and asked the spirit of the man to come back and continue to protect the buried gold. And thus the firehouse became known as haunted. In 1946, Earl Richardson acquired the property with the intention of building a home upon it. His very first night staying on the property he ran across the ghostly Native American and suffered from frightening chills along with the feeling of being pushed down while he lay in bed. Although he built his house, tearing down the former firehouse, every now and then, the chills would return, and other strange phenomenon would once in awhile happen. Earl’s neighbor also reported strange noises occurring occasionally. Earl’s family had an unexpected addition to it. The location of the former Old Firehouse, the ghost of the Native American, and perhaps even the missing gold, lies on Cain Ranch, which is about three hundred yards off of Whitney Portal Road. Additionally in Lone Pine there’s a no longer used train depot somewhere off of Highway 395. The baggage compartment of the depot occasionally exudes eerie darkness and if that wasn’t creepy enough, there are reports of a little ghost girl lurking behind the ticket counter holding a doll in her arms. If that’s not enough spiritual activity for you, rumors state that the Best Western has a tall, thin, vanishing cowboy ghost who appears in several hotel rooms in the early hours of the morning. Also the nearby ghost town, Cerro Gordo, is home to a spirit or two, and lastly, it’s said that on dark nights a ghostly ship sails over the dry lake bed of Owens Lake!